Treatment tables govern the exact times and depths that the patient will be repressurised to in the hyperbaric chamber. In the UK we use tables devised by the Royal Navy, based on the original tables developed by the US Navy. Different tables are used for different conditions, as detailed from the links below. 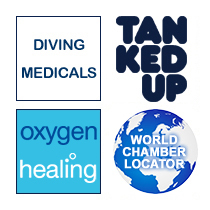 The most common table for initial treatment for divers with decompression sickness (DCS). Commonly used for residual decompresion illness (DCI) symptoms. Often used for Type I decompression sickness (DCS).